I was born and grew up in Saigon. After high school, I studied maths at university and graduated in 2009. Most of my classmates chose to become a teacher, or pursue higher education, but I decided to become a programmer. I started off programming with Java and related technologies. At that time, my role was a DevOps. I was exposed to many types of products, such as games, payments and advertising systems. In mid-2016, I wanted expand my knowledge and expertise in mobile and blockchain. They’re literally interesting to me. I’m responsible for developing the Blockpass mobile app. It’s published on both Android and iOS. I usually start the day with checking Asana, where we store our project progress, all task updates and details. When the team arrives we usually do a casual daily meeting either face-2-face or on Skype. We usually discuss past tasks, current tasks, any issues that need technical support or business decisions. I found that afternoon is the best time for me to concentrate on my own technical tasks, or reading some Medium/Quora articles because the office is pretty quiet at that time. I consider myself fortunate to be a part of the Blockpass team. In the end of 2017, my ex-project was shutdown by users cheating payments. At that time, I started looking for a new path, and became interested in blockchain, the technology can make everything be transparent with high security. 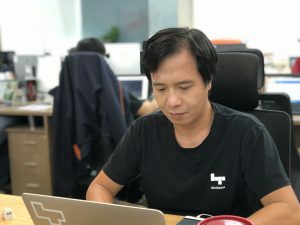 Fortunately, I got an opportunity to join Infinity Blockchain Labs, a joint-venture partner of Blockpass. And now I’m a part of the Blockpass team. Beside the transparency that people are discussing, I want to mention security. These two most important reasons make blockchain standout from traditional systems. According to what I learnt and experienced in blockchain, I believe within 2 years blockchain will advance very fast to a new level. Going post-Quantum may be the next trending technology after blockchain.